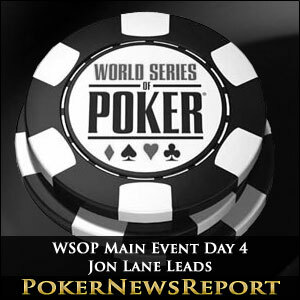 The fourth day of the WSOP Main Event is now over and Jon Lane ended it as the man on top of the chip ladder, with 2,839,000 chips to his name. 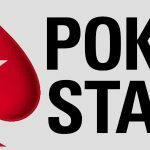 A total of 239 players made it to Day 5, with well-known players such as Annette Obrestad and last year’s Main Event winner Greg Merson still in the hunt for the top spot. Obrestad finished the day with a stack of 1,186,000, while the defending champion will go into the fifth day with 635,000 chips. A number of players were eliminated on Day 4, 427 of them to be exact. Most of them made it in the money though, with only the first 18 players knocked out to fall short of a cash prize. 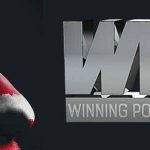 Players such as Isaac Haxton (455th), Michael Mizrachi (473rd) and 2008 WSOP Main Event runner up Ivan Demidov were eliminated on the day, but still managed to cash. In what may have been last hurrah on the poker table after a fifty plus year career, 79-year-old poker legend Doyle Brunson was also eliminated in the mid stages of Day 4. With K♦ 10♠, the man known as Texas Dolly raised to 86,000 before the flop, only to be reraised all in by Sergei Stazhkov, who had 10♥ 10♣, which was called by Brunson. The Russian’s Tens held on the 7♥ 3♣ 2♣ 9♥ A♣ board and Brunson was eliminated from the event in 409th place, still good for a cash prize. 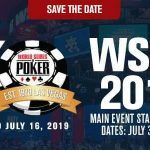 While he did not have a super high finish in the event, Brunson certainly had a strong showing, and he received two well-deserved ovations from the entire room as he made his exit in what might be his final WSOP Main Event. He was dominated was Lane, who had A♦ K♥, but nonetheless, he took a bit of time before deciding to make the call. Immekus got himself a straight draw after the flop came 7♠ 3♥ 2♠, but it did not come as the turn showed K♣, giving Lane a pair. The 6♦ on the river was also not what Immekus needed and he was out while Lane boosted his stack to 2.7 million. While Lane is not a huge name in the world of poker, he is no stranger to the top levels of the fame. The native of Wisconsin has ten WSOP cashes to his name thus far, with two of them coming in previous Main Events. He has also reached the final table in three other WSOP events, which gives him a wealth of experience in live professional poker. 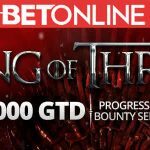 He’ll hope to go one better as he aims to keep his chip lead en route to winning this year’s Main Event and the $8.3 million top prize.